Cool toned paint integrates well with the other cool tones in this bathroom. If you are considering sprucing up or changing your bathroom but aren’t sure precisely what to do, a fresh coat of paint is a great place to start. If you are looking for inspiration and tips on how to choose the right bathroom paint colors for your bathroom, read on. Keep these tips in mind to ensure you have a bathroom you will love. When painting most rooms in your house, you can be sure that the paint cards and samples are a decent representation of how it will appear on your walls. This is not the same for bathrooms. Bathrooms are often small, unconventionally shaped, and lack the natural light. This makes it crucial to look at samples in the bathroom, with its unique lighting, before you choose any color. What looks like a safe neutral tone in natural lighting or under the store’s lighting can look wholly different under the artificial lighting of your bathroom. If you are unsure of where to start, or if you have a few ideas in mind, be sure to pick bathroom paint colors which will complement your flooring. For warm toned flooring, choose a warm toned paint. For cool toned flooring, choose a matching paint. This will ensure that the room has visual flow and all of the undertones work together, rather than clashing. This will give you a beautiful end result. When choosing bathroom paint colors, it is far more important to choose something that you like than to blindly copy trends, but many trends become trends for a reason. 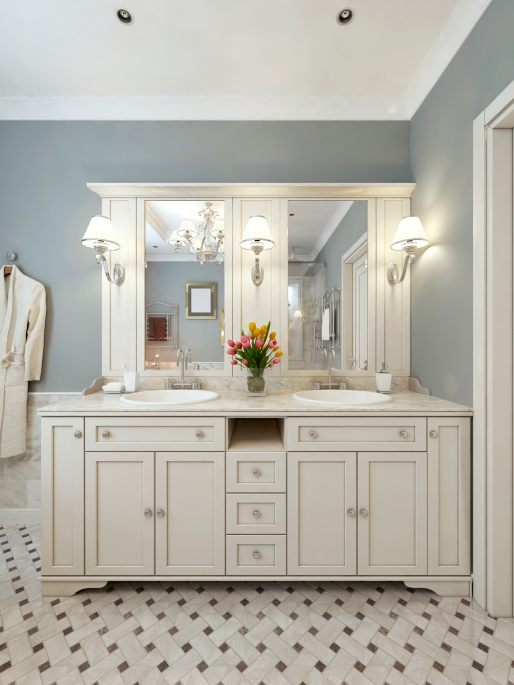 Considering the cramped space and artificial lighting of bathrooms, many interior decorators strategically choose colors which work under these conditions. Noticing these trends will give you a solid starting point and may even show you some clever ways to incorporate your favorite colors into a bathroom with a cohesive and beautiful look.